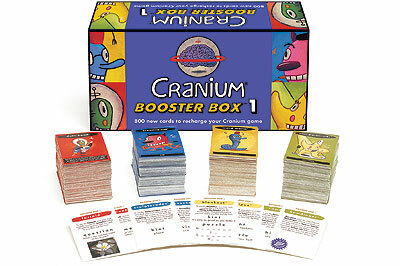 In response to overwhelming customer demand we â€” the wacky crew at Cranium Central â€” have created Cranium Booster Box 1. Booster Box 1 is bursting with 800 all-new cards for the Cranium game. We promise that Booster Box 1 is more outrageous, more challenging, and more hilarious than ever. To recharge your Cranium game, simply mix in or replace your original game cards with Cranium Booster Box 1 for hours of more fun. Other products in the "Cranium" series.